Most traditional histories of role-playing games in Japan open somewhere along these lines: "In the beginning when Enix created the JRPG, they called it Dragon Quest. And Enix saw that it was good." More elaborate investigations might point out that there was a Westerner named Henk Rogers who brought the gospel genre to the Land of the Rising Sun. Well, we've already shown that this is not a full account either, as there has been about a dozen games that more or less apply to the "RPG" label before that. But even when knowing about the games' existence, it's not easy to actually experience them. 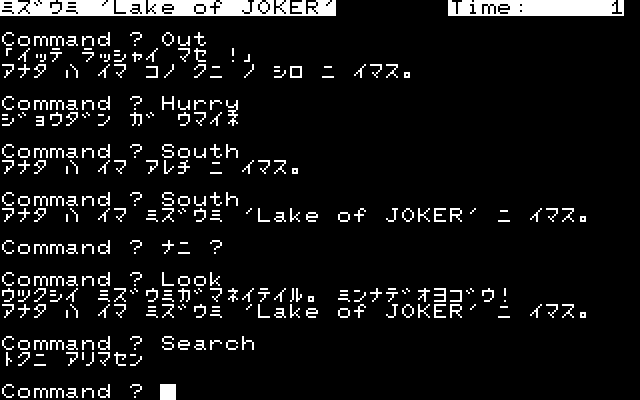 Aside from the language barrier, actually obtaining a Japanese home computer game from the early 1980s may well feel like a quest for the holy grail, leaving emulation as the only option. But even tape and disk images are by far not as easy to come by as your average NES or SNES ROM, the emulators aren't well documented in English and as we will see, some titles just don't seem to be accessible to non-Japanese retro gamers, or even not at all. Today it may surprise gamers that the game was published by Koei, but back then, they were the RPG company in Japan, accounting for half of all the titles released by the end of 1983. 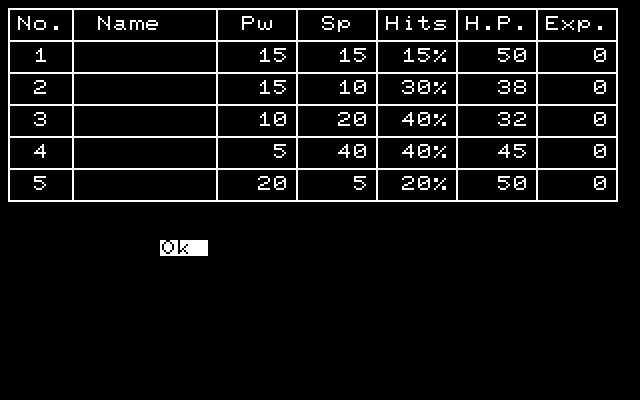 The player has control over a party of five characters, although their stats are fixed, and all one gets to customize are their names. The two main stats appear to be Power (Pw) and Spellcasting (Sp) - at least Sp is not speed, cause the turn order is always fixed. However, there is no command to actually cast a spell during combat, so the weaker characters are at a severe disadvantage. 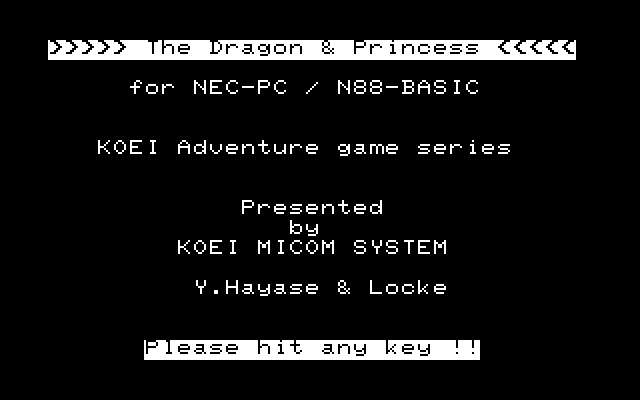 Other than most of its immediate successors, The Dragon and Princess is actually so kind as to spell out the keyboard shortcuts for you at the beginning, which are similar to what you'd know from the likes of Ultima. During the test play run, (S)earch, (G)et or (R)ead never brought any results, and the only human beings encountered were the king and princess in the starting castle. The party is sent out by the king to kill bandits and bring back the treasure they stole, plain and simple. The eponymous dragon might factor in after the required amount of gold is delivered, but so far there's been no sight of him. 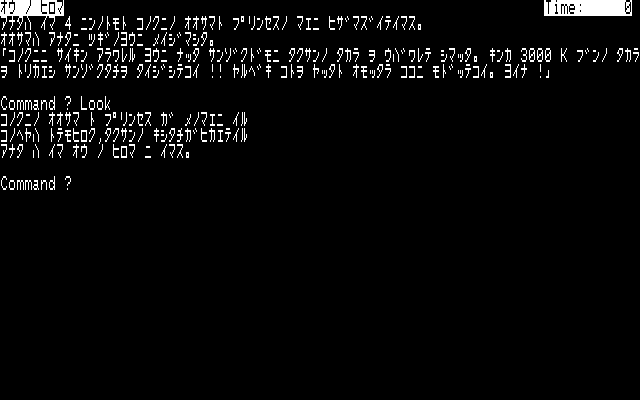 The main adventuring mode is entirely text-based and works like any other text adventure: (L)ook gives a brief description of the surroundings, while the numeric keys are used to move to each of the four cardinal directions. If you've learned some Japanese, you'll notice that all text is in katakana, which due to its simple layout was basically the standard computer font, until higher resolutions became the norm and allowed for proper kanji and hiragana display. Unfortunately, katakana, being usually used for foreign loanwords only, is likely not the script most learners are best used to reading. The party might be randomly attacked by some animals, bandits or monsters, upon which the game creates an overhead tactical view. The tactical options are severely limited and the game suffers from Final Fantasy I syndrome, with characters and enemies alike fumbling most of their attacks, drawing out even the most small-scale battles. 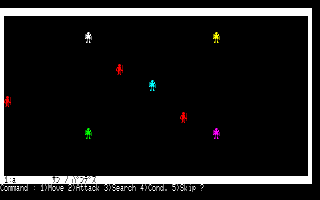 The fact that these mode exists in the first place is pretty damn interesting, though: Japanese sources date the game's release at late 1982, which means it was published before Ultima adopted the tactical party combat in Exodus. This leaves only two explanations: Either Mr. Hayase and Locke got this idea on their own, or they've played the obscure Tunnels of Doom (1982) on a Texas Instruments computer, the first RPG to ever use this kind of combat. Unfortunately, there is no balancing whatsoever to the fights: During my run, I encountered a single snake, then two spiders, all of which were completely helpless. On the way back through the same territory, my party was ambushed by a brigand and a monster. The latter alone completely obliterated the heroes, ending my futile attempt at getting anywhere in this game. In case anyone wants to try out the game themselves, the only available version of the game is hidden within a compilation disk. Thanks go to the community over at Tokugawa Corp. for their relentless efforts to unearth and share old Japanese computer software. Fantastic entry. I cannot emphasise enough how keen I am to read more entries like this. Truly fascinating. Furthermore, I hope you eventually compile them into a full site article, since they are more valuable than a mere blog entry. Fantastic article! I'd love to see more of these, no matter how small they are. It's articles like this that make me keep coming here. Thanks! This version is a later port released in 1983.